Today we make mention of one of the national parks of the Spanish territory. 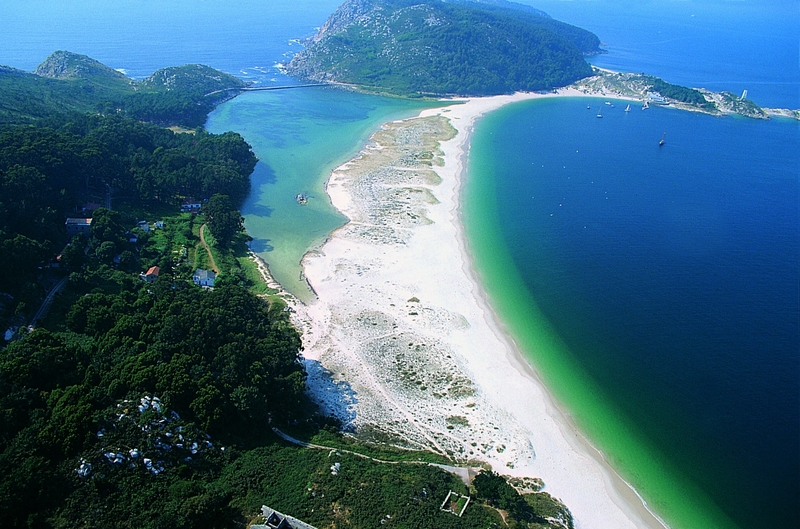 The National Marine Land Park of the Atlantic Islands of Galicia, is the first and only space with this category of the Galician autonomous community and the second in the national maritime-terrestrial territory, next to the Archipelago of Cabrera in the Balearic Islands. From the estuary of Arousa to Vigo, these islands are chained, emerging from the ocean and beautifying the seascape with the magic of its cliffs. In its entrails, at the bottom of the sea, the most precious ecological riches of this National Park are guarded, guarded by the guns of the old ships here sunk. It is undoubtedly a place to discover the mysteries and legends of the Atlantic. These islands were declared National Park in 2002 as one of the best samples of the ecosystems typical of the Spanish Atlantic coast and seabed. The National Park comprises the archipelagos of Cortegada, Sálvora, Ons, Cíes and the maritime space that surrounds them, constituting this marine strip 86% of the total protected area, which gives us a clear idea of the importance of the marine environment in this Protected space. This diversity of scenarios accommodates a large number of species: more than 200 types of algae among which refuge and rearing large numbers of fish and molluscs, seabirds that nest on cliff ledges and fish in shallow waters , Plants surprisingly adapted to live between the sand of the dunes or in the narrow cracks of the cliff. The possibilities offered by hiking, diving, gastronomy and relaxation make it a destination for all tastes and budgets.